Washington: How many stars like our sun host planets like our Earth? NASA’s Kepler Space Telescope continuously monitored more than 150,000 stars beyond our solar system, and to date has offered scientists an assortment of more than 4,000 candidate planets for further study -- the 1,000th of which was recently verified. "Each result from the planet-hunting Kepler mission's treasure trove of data takes us another step closer to answering the question of whether we are alone in the Universe," said John Grunsfeld, associate administrator of NASA’s Science Mission Directorate at the agency’s headquarters in Washington. “The Kepler team and its science community continue to produce impressive results with the data from this venerable explorer." With the detection of 554 more planet candidates from Kepler observations conducted May 2009 to April 2013, the Kepler team has raised the candidate count to 4,175. 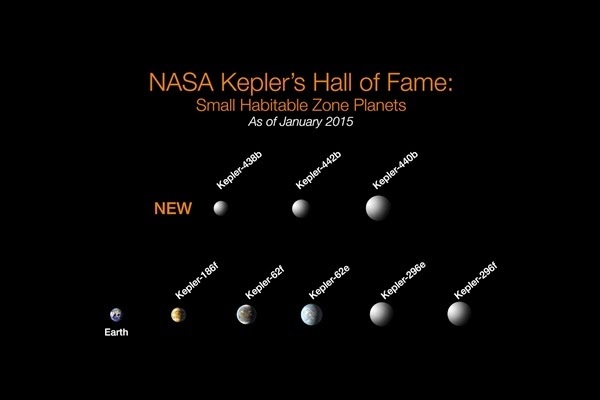 Eight of these new candidates are between one to two times the size of Earth, and orbit in their sun's habitable zone. Of these eight, six orbit stars that are similar to our sun in size and temperature. All candidates require follow-up observations and analysis to verify they are actual planets. “Kepler collected data for four years -- long enough that we can now tease out the Earth-size candidates in one Earth-year orbits”, said Fergal Mullally, SETI Institute Kepler scientist at Ames who led the analysis of a new candidate catalog. “We’re closer than we’ve ever been to finding Earth twins around other sun-like stars. These are the planets we’re looking for”. These findings also have been submitted for publication in The Astrophysical Journal Supplement. Work is underway to translate these recent discoveries into estimates of how often rocky planets appear in the habitable zones of stars like our sun, a key step toward NASA's goal of understanding our place in the universe.